Queen Ilnora of ANAMARETH, the City Unforgotten, is the ancient ANKELESHIAN Lich Queen that rules over the desolate Isle of Karn’lothra in the far reaches of the WESTERN OCEAN. Living many miles from the main continental landmass of MIDGARD, she runs her kingdom according to how she pleases, but remembers the GREAT KINGDOMS of yesteryear and expects tribute from the Lords of the WESTERN REGIONS whenever they visit. She is aware of the passage of time and the general demise of the Elves but does not know much of what happens EAST of BARSELLA, save that a “young” ELVEN upstart still holds power in the Grand Duchy of Dornig. SCHMIDT HAPPENS first met the QUEEN on a mission initiated by the Great Geomancer, SIMEZ ROTHGAZZI. On his instruction they sought out the TOMB OF QORAZ where they found the ancient BOOK OF VAEL TUROG. 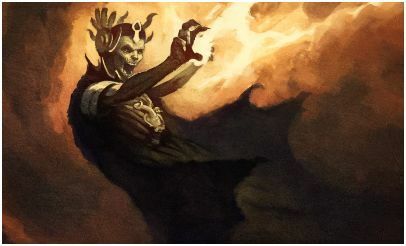 QUEEN ILNORA rules her kingdom with an “iron fist”, mercilessly using her WIGHTS, SHADOWS, DRAUGR, REEFCLAWS, and DHARAKUL servants to subjugate the few human slaves that eke out a miserable existence on the VOLCANIC island of numerous tombs, graves and cenotaphs, guarded by her dedicated LICH HOUNDS. She has several ships at her command and will sometimes raid small islands on the WESTERN OCEAN but rarely sends any travellers to the mainland of MIDGARD.